Fresh off the release of their Top 40 albums of the year, Decibel magazine have announced the lineup and dates for another yearly tradition, the Decibel Magazine Tour. 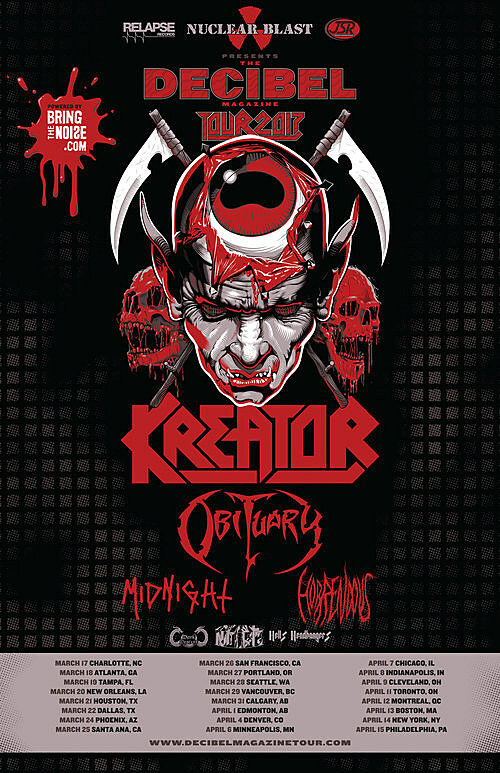 The tour runs from the middle of March through the early days of April and features Kreator and Obituary as headliners with Midnight and Horrendous as support. Kreator and Obituary are both hitting the road to promote upcoming records, but are also established heavy-hitters that can fill rooms. The two acts lower down the bill are both buzzy, Horrendous in particular got a lot of love in these parts last year, but have yet to breakthrough to the wider metal audience. A tour like this could be a big boost in their profile, if fans show up early of course. Check out the dates for the Decibel Tour below and read our coverage of 2016’s Decibel Tour here. If the Decibel tour doesn’t satisfy your need for seminal workhorse thrash bands, Testament have also announced an extensive tour promoting their new album Brotherhood Of The Snake with support from Sepultura and Prong. Unlike the Decibel tour, this tour is aimed entirely at the old heads, or the young heads with a taste for older bands. You know what you’re getting here, but Testament are pros.